In its quarterly house price analysis released Thursday, the Canada Mortgage and Housing Corporation says Toronto, Regina and Winnipeg are at "high risk" of a housing correction for a variety of factors. The housing agency looks at market conditions in 15 major housing markets across the country. While most markets get a low or moderate risk in the CMHC's eyes, the agency singled out Regina, Winnipeg and Toronto for being in a possible danger zone. The reasons for concern are not the same in each city. 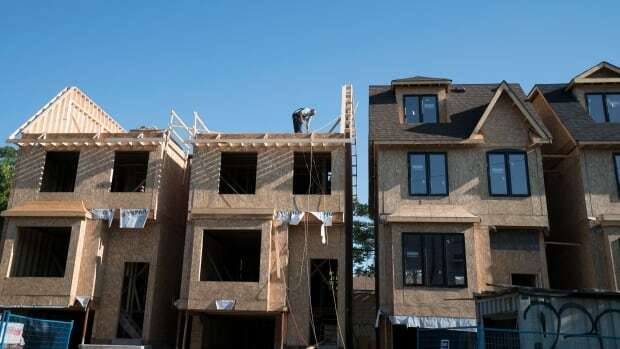 In Toronto, the main concern is that "the rise in house prices has not been matched by growth in personal disposable incomes" the CMHC said, adding there is evidence of overbuilding in the market, with a historically high level of unsold units. Toronto's conditions have gotten worse since April, when the city was deemed to be at "moderate risk" of a slowdown. Regina and Winnipeg, meanwhile, were singled out in the CMHC's last quarterly report in April. "The high level of risk in Winnipeg reflects risks of overvaluation and overbuilding, while in Regina it reflects price acceleration, overvaluation and overbuilding, particularly of condominium apartments," the agency said. The rest of the country is deemed to be in pretty good shape from a risk perspective. Montreal and Quebec City's housing markets were deemed of moderate risk despite the presence of some overvaluation. And the CMHC says Vancouver's housing market is a "low risk" one despite sky-high prices, because demand is backed "by a growing population and growth in personal disposable income." The last time the CMHC put out its quarterly report, there were only 12 cities in it. This one expanded the scope to 15 and of the three new ones added — Victoria, Hamilton and Moncton — each of which were assessed as "low overall risk" in terms of their housing markets. Don't believe this stuff... Harper has said the economy is fine... he told us not to worry. But, if you vote for another party other than the conservatives, well... in that case only will everything fall apart and you will be broke and homeless. The economy will go into depression, and it will all be because of how you voted. It will have nothing to do with how Harper, the great economist and leader, ran the country. No, no, no.... the PM has no control over the housing policies, over the refinery capacity, corporate taxes, corporate subsidies, trade and manufacturing... he has no control over the economy at all. But make sure you reelect him or the economy won't succeed without him. Just give him another term, he will turn the economy around from all the problems that occurred since he was first elected. Praise Harper. It is shameful in the extreme that there is not more affordable housing in Canada considering new technologies and the wealth of resources at our disposal. And the fact there has been nothing substantive done by the federal government to assist such development is equally disappointing. The bottom line is that houses are greatly overpriced across Canada because Harper did nothing to stop the insanity. Now the banks know that the interest rates have to stay low or there will be thousands of foreclosures flooding the market. Harper's policies are definitely partly to blame. Anyone who can't see that has milkshake for brains or is a clown. Take your pick.